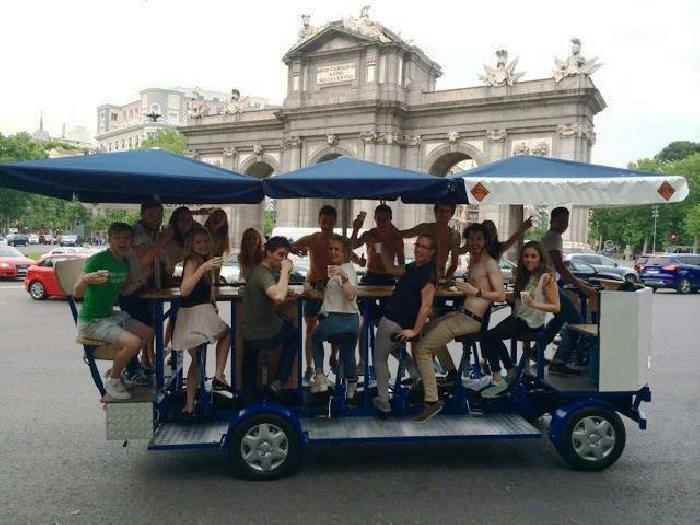 One of the most popular and unusual activities that Red Mago has up its sleeve is the Beer Bike, a zany cross between a team sport, sightseeing and relaxing at your favourite bar…all at the same time! But how is all this possible? We’ve engineered a vehicle that puts the pedalling in the hands (well, feet actually) of SIXTEEN people at once! Once we had the muscle-power sorted out, it was an easy job of combining it with that most important aspect of group fun….beer! Laying in the middle of the Beer Bike is a wooden countert op set out with chilled beer on tap! Your group provides the pedal-power and we provide a driver to take you around the city! 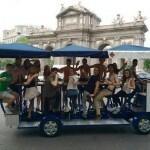 We have Beer Bikes in Barcelona, Madrid, Valencia and Lisbon waiting for your group to climb aboard. 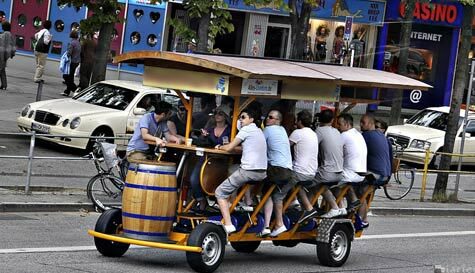 If you think about it, the Beer Bike brings together all the elements of a perfect team-building activity – work together on a common goal, forge better relationships and increase morale! 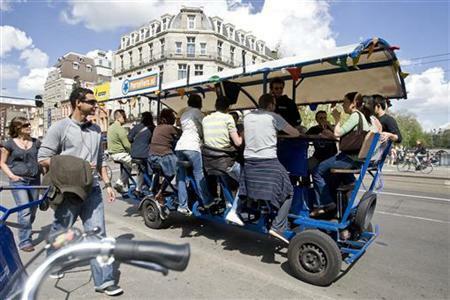 Is there anything a Beer Bike can’t do? We provide chilled beer on tap and our expert guide steers your team to the best sites of the city and acts as an onboard DJ – Beer Bikers have been known to sing their hearts out while on the road! If you bring some tunes we can play those on our thumping sound-system , or leave the music to us and we’ll get that festive spirit moving! Beer Biking works up a thirst! Your team is going to see the best of the city while powering down a few chilled beers together – create positivity and enjoy a reward for a job well done. As you sit around the rolling bar together, pedaling forward as the beautiful city appears before you, a sense of fiesta always elevates the mood. We have an actual chilled keg of beer tapped for you to enjoy as you ride! 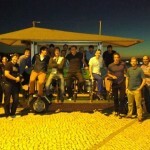 Beer Biking in Barcelona, Madrid, Valencia and Lisbon! There simply isn’t anything more festive than touring around on our customised Beer Bikes in some of the most beautiful cities in the world. Memories are made, songs will be sung and beer will be drunk! 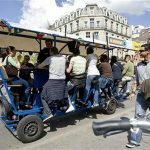 Nothing bonds a group together more than a shared experience of fun and adventure – a Beer Bike is a celebratory event that lifts the spirits of everyone who does it – even onlookers are amused! Your team contributes the energy and our guide does the rest. 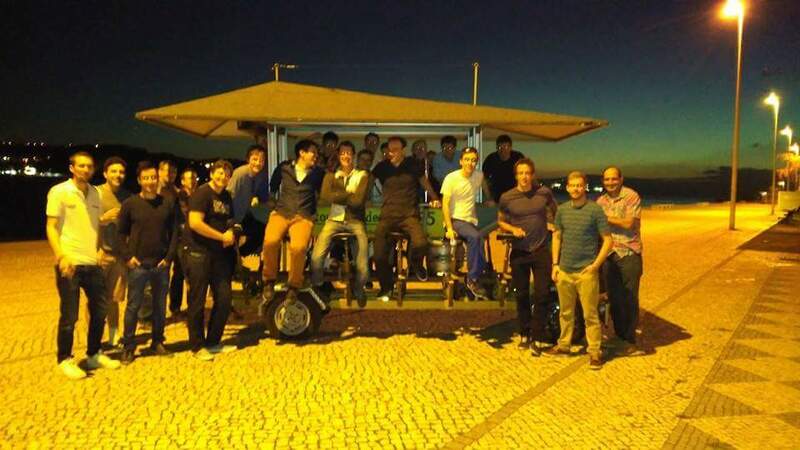 Red Mago organises activities around your schedule, so the Beer Bike rolls when you want it to! Equipped with LED lights our Beer Bike can go anytime- our night-rides provide entertainment for all – the party beats, the disco lights and your very own mobile bar – all aboard! Business meetings will never be the same. You want to make your trip to Spain or Portugal spectacular. You’ve come all this way for a conference or important meeting and you know that your team is going to need something to inspire and recharge. Something out of the ordinary. 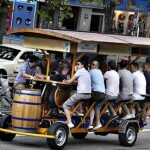 Imagine strengthening your new business connections on a Beer Bike! All things considered, a Beer Bike experience combines all the essential aspects of a successful business relationship: moving forward towards a common goal, boosting team effectiveness and developing experiences that will create lasting positive impressions…with beer! Whether it’s day or night, during a busy series of meetings, or a corporate outing of quality, Red Mago stands ready to create custom events for your group that are unusual and spectacular. Contact one of our representatives and let us arrange an events package that is sure to entertain and impress!